Then I went to the White Cloud Temple. Yes, yet another Taoist temple... But I prefer the Toaoists temple to the Buddhists ones. 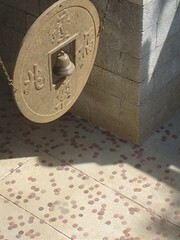 For 10 Yuan you could buy 50 coppers coins and try to hit the bell with those. It was very enjoyable, while visiting the temple, to hear from afar the sound of the coins hitting the bell or the big plate around it. It really adds up to the already relaxing atmosphere of a Taoist temple. I went next to the Lama temple. This temple is commonly referred as The Buddhist Temple You Absolutely Have to Visit in Beijing as this is temple where the Dalaï Lama goes every time he comes to Beijing. But I think that the most interesting thing about this temple was that the entry ticket is actually a CD Rom. Beyond that, nothing special. Yet it's a very big and beautiful temple but I didn't feel the same atmosphere I felt when visiting the previous Taoist temples. I think this is mostly due to the fact there were way to many people. This, and that I'm not fond of the Buddhist folklore. At last, I went behind the Forbidden City and enjoyed a *great* view on both the Jingshan and the Beihai parks. Amazing athlun! !I didn't think you would actually do me this favor.Besides you know me well: The world is not enought!lol This is why I have some suggestions for improving your next footages.See You at yourmail box^^. Hmm, maybe I'll take some of your suggestions into consideration. At least don't shake so much your digital camcorder and don't rotate it!!! But it is a really fine idea! to prove us that you eat chineese food!